I can't decide whether it's a giant cupcake or an ice cream...but I somehow feel rather edible in this dress! Sick of having nothing to wear for those grander occasions in life (no really, it's true), I've been on a wee spending spree of late, and this is one of the spoils. 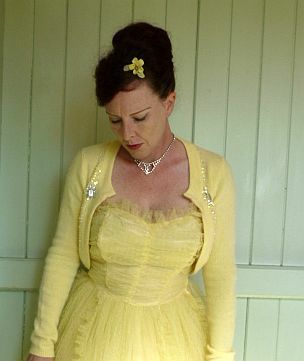 Being an original 50s tulle ball dress bought on the cheap, it isn't without its issues. 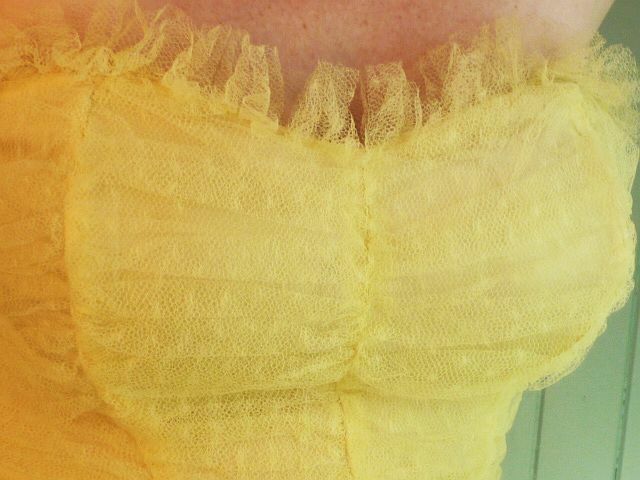 It would originally have had 2 flowers along the top of the bodice here, but only one remained. 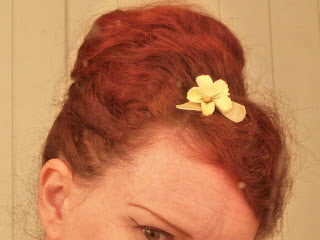 I calmly pulled it off and sewed it on to a hairclip, et voila, it's a matchy-matchy made in heaven that also hides regrowth. The matching tulle wrap is sweet, but this beaded angora bolero is more suitable for winter evenings. Now I just need a dressy occasion to present itself!! love your hairstyle and shimmery jewelry. 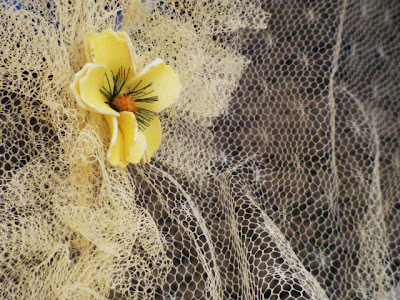 your angora bolero is divine. and your chi chis are calling me. 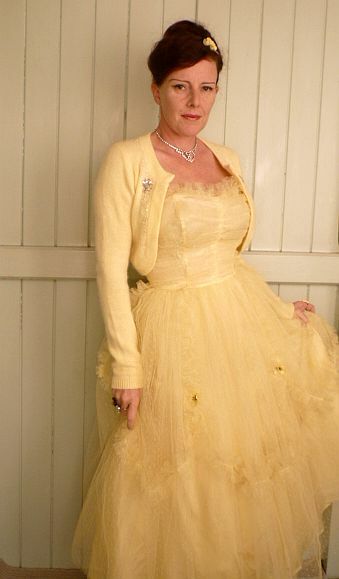 I always wanted one of these fancy frocks ,but never could find my size. Weall wish we could eat you and look soooooooooooooo good. I adore this dress...and the sweater and all your details.....LOVE it. Oh that is just gorgeous....what a confection! Beautiful. Ohh! You do look rather delicious Kitty. The dress is BEAUTIFUL.I love the frills along the skirt. I want a 50's party dress for myself in green. Every now and then I scour the web here and there. But when I do see ones that are dreamy... I always say to myself "But when will I wear it" Maybe I will put it on my Christmas list. And wear it on New Years! You are a vision - truly. 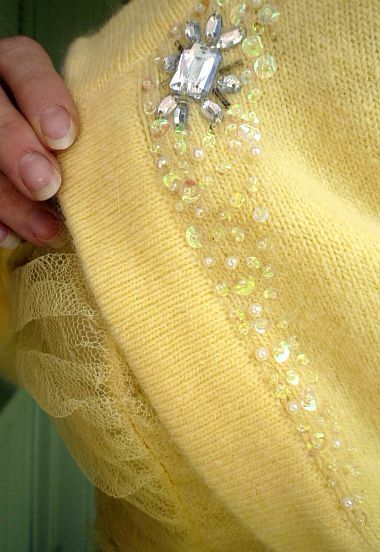 I love how you have taken this floaty light, sweepy confection into winter with that fabulous bolero sweater too. A grand match. Your sparkles add that fairy magic. I hope you find an Occasion!! Dressy shmessy! Wear that out to do your shopping, girl. You will be the talk of the town in that gorgeous frothy frock of sunshine yellow. Oh primrose heaven!!!! You look so very very beautiful. Big sigh!!!! 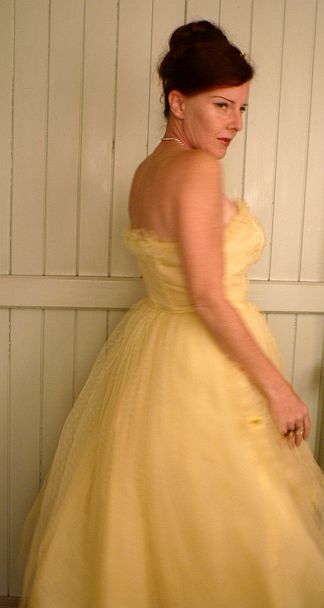 A pretty 50's dress always makes my heart sing. The dress is gorgeous and you look utterly stunning in it. Oh for cuteness sake!! Love this fit and flare confection on you!! 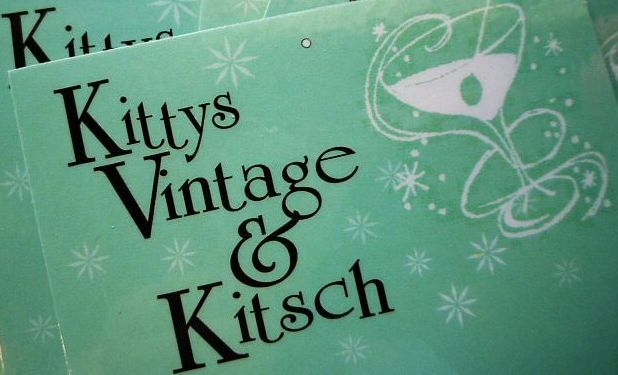 Oh you look heavenly, Kittylicious! Like an ice cream sundae! (That's good, by the way...) I adore it with the little bolero cardigan and the pulled-off flower! Gorgeous!!! You look fantastic in that dress. Love it. 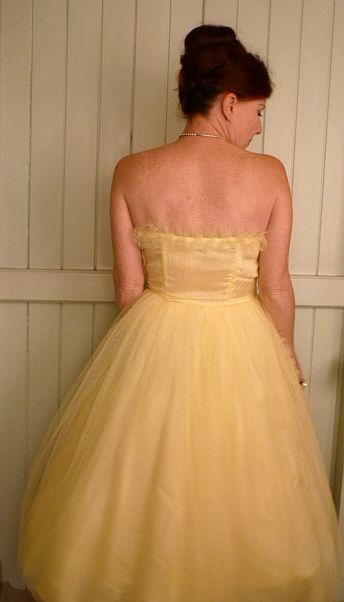 I have a friend getting married next year and I really want to get a 50s style prom dress to wear to it. They are so pretty! Frenchie? Is that you?! So gorgeous and totally Frenchie at the high school dance. I love it! Your dress is gorgeous, its like a yummy meringue, BEAUTIFUL! I would wear that dress everywhere! It's so beautiful.